Unit circle plays a vital role in trigonometry. 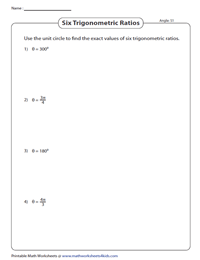 The unit circle worksheets are intended to provide practice in using the unit circle to find the coordinates of a point on the unit circle, find the corresponding angle measure, determine the six trigonometric ratios and a lot more. Understand the pattern for the first quadrant using the unit circle chart, a key to find the values of the other three quadrants with ease. 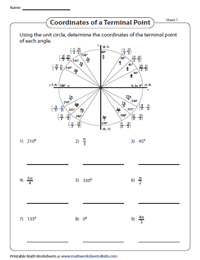 Familiarize students with the unit circle by employing these worksheets. Keenly observe the unit circle diagram use the angle measures to figure out the corresponding coordinates and complete the unit circle. 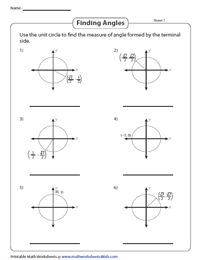 Incorporate these simple unit circle PDFs to determine the coordinates of the terminal point for the given angle measures. 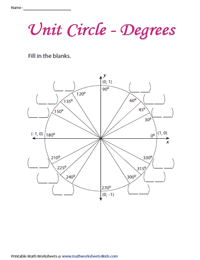 Unit circle diagram is provided in each worksheet for reference. Using the unit circle, find the measure of the angle formed by the terminal side and represent it as degrees or radians. 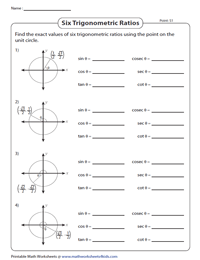 Reiterate the concept of the unit circle with this set of worksheets. Employ the unit circle to find the six trigonometric ratios using the given coordinate point on the unit circle. 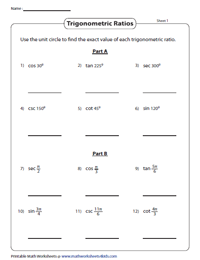 These two-part worksheets offer exercises to determine the exact value of a specific trigonometric ratio given as degrees in Part-A and radians in Part-B using the unit circle. Determine the values of six trigonometric ratios by applying the measure of the angle encompassed by the terminal side on the unit circle. Instantly validate with the answer keys provided. 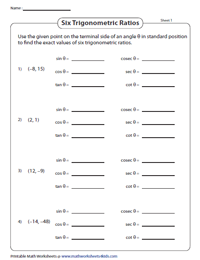 These unit circle revision worksheets feature exercises to determine the values of the primary and reciprocal trigonometric functions using the given coordinate point of the terminal side in the unit circle.